The United States Department of Homeland Security requires Designated School Officials (DSO) at institutions of higher education to obtain copies of visa and I-20 forms for all enrolled international students, and to maintain accurate records in the Student and Exchange Visitor Information System (SEVIS) to ensure that they are maintaining F-1 status throughout their stay. The DSO is located in the Registrar’s Office on the 2nd floor of Palmer Hall. Incoming international students must report in person to the DSO no later than the program start date listed on their Form I-20. 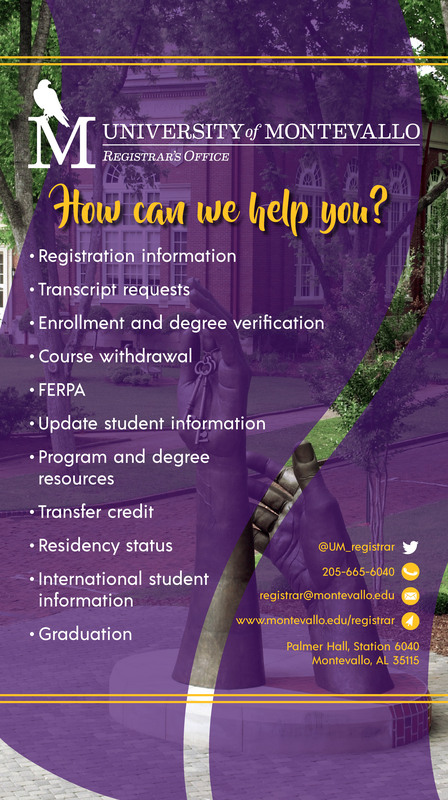 Returning international students must check in with the DSO every term and should provide any documents and/or information pertaining to Form I-20, Form I-94, work permits, employment status, extensions of status, and other government issued documents (e.g. passport, F-1 visa). The DSO can be contacted at 205-665-6039.